“Related categories” presents three women painters who share an approach dominant with the lyrical fusion of movement and paint. Isabelle Maynard, a french artist who divides her time between Toulouse, France and the bay area, presents canvases combining drawing and painting originating by drawing with her eyes closed. Her process results in fresh marks, both bold and delicate, sometimes primitive, worked into without overthinking and reflecting unbridled bodily movements. Influences include: Willem de Kooning, Antoni Tàpies, Pierre Soulages, and Cy Twombly, the postmodernist choreographer Trisha Brown, and German choreographer, Sacha Waltz. Maynard’s work has been shown throughout France, as well as in Spain and Brooklyn. Anastasia Faiella, a bay area performance artist and painter, shows her work for the second time at 60SIX. 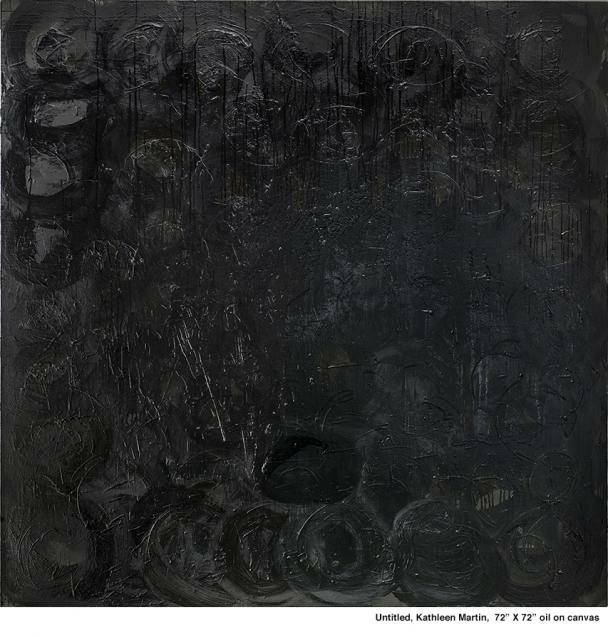 In this exhibition she presents oil paintings from a series called “Stream of Consciousness.” The works combine writings in graphite and oil paint layers in various thicknesses, which allow the materials an organic reaction. A hint of landscape sometimes emerges within this marriage of the hand of the artist and the action of the materials. Anastasia holds an MFA from the University of California, Berkeley.